Hong Kong police have arrested several people as they cleared the last remaining pro-democracy protest site. For more than two months activists have staged sit-ins in the centre of the shopping district of Causeway Bay, along with two other areas. The biggest protest site, in the Admiralty area, was dismantled by police last week. After Monday's clearance Hong Kong leader CY Leung declared an end to the "illegal occupation activities". The protesters have been campaigning for fully free elections to be held in the city, something Beijing has ruled out. Activists were given a warning to vacate the Causeway Bay site before police set up a cordon around the area and began removing tents and protest materials. A small group refused to leave and police arrested a handful of people. Protesters vowed this was not the end of their movement. "It feels a bit depressed and hopeless, but at the same time this is just the beginning, it's not the end.... We still haven't got what we wanted..... 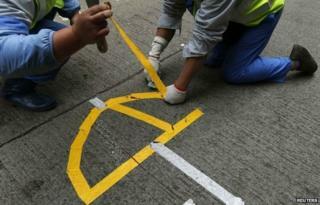 It's awakened the Hong Kong people," said 18-year-old Otto Ng. Afterwards CY Leung declared the protest movement was over. "Following the completion of clearance work in Causeway Bay Occupy area, the episode of illegal occupation activities for more than two months is over," he told reporters. The Chinese and Hong Kong governments have maintained that the blocking of roads by protesters constitutes an illegal gathering. China has said it will vet the candidates for Hong Kong's chief executive elections in 2017. Activists say they want universal suffrage and a free choice of candidates, but have not received any concessions from the Hong Kong or Chinese governments. Last week the main site in the Admiralty area was cleared by police and almost 250 protesters were arrested. The mass protest began in September as two separate movements by student groups and activists from the group Occupy Central. Numbers were high in the early stages, with huge crowds on the streets, but later dwindled down to a smaller core of protesters. One of the leaders of the Occupy Central group, Benny Tai, wrote for BBC Chinese after the removal of the main protest site that a new generation of democrats had been born in Hong Kong. "Compared with their predecessors, the Umbrella Movement generation is more persistent, more progressive, more flexible and more creative; Hong Kong's democratisation process will not end with the end of the Occupy Central movement, but it will continue with new energy and vigour." He also said that peaceful protests would continue as long as the Chinese government did not respond to the demands of the activists.